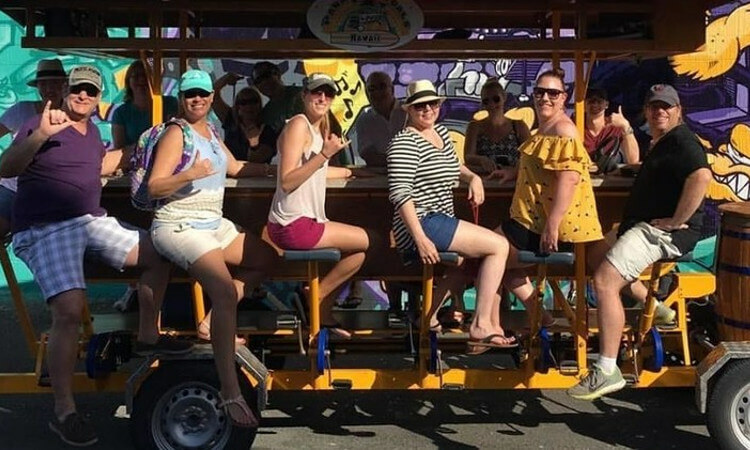 Hop on Hawaii’s only 15-passenger bike and pedal with folks from around the world or book the entire bike for a private party! Paradise Pedals Hawaii is a party bike from the Netherlands that is pedal-powered by its riders … that’s YOU! Called “Het Fietscafe” in its native country translates to the “Bike Cafe” here. A company driver steers you along the chosen route, stopping at various bars & attractions, while on board speakers crank out the tunes. Hop on Hawaii’s original 15 passenger bike and pedal with folks from around the world or book the entire bike for a private party! A company driver cranks up the music, then rings the bell to let everyone know it’s time to pedal and steers the giant bike through Kaka’ako, Honolulu’s popular artsy warehouse district. Pedal to 3 brewpubs & bars for approximately 35–40 minutes, enough time to enjoy a craft beer or cocktail and appetizer at each stop. Pay as you go on this 2.5 hour tour on wheels! Pedal through Kaka’ako, Honolulu’s popular artsy warehouse district. Stop at 3 brewpubs/bars for great beer, cocktails and good times. Pay as you go on this 2.5-hour tour. Our company driver will steer the giant bike and crank up the music! Hawaii state law prohibits open container on the party bike, so you can’t drink while you’re on the bike. The Party Bike has a minimum height requirement of 5′ for pedaling seats and we do have 5 non-pedaling seats. There is a maximum weight limit of 300 pounds for each person on the bike seats. The back seat is perfect for those who do not meet these requirements. We suggest shorts and tennis shoes or flip flops, aka “slippas”. Miniskirts and high heels are not recommended. Our tours often sell out. We recommend booking ahead to avoid disappointment. Hotel pick up is available at select hotels for an additional charge of $25. Look for this option at check out. The bike requires a minimum of 6 passengers to power the bike. Paradise Pedals tours in the wind and rain. If the conditions become unfavorable and/or dangerous, we will end the tour immediately and issue rain checks and/or refunds accordingly. Customers will receive a full refund with 72 hours notice of cancellation. All of our tours require a minimum of 6 pedaling passengers. In the event we do not meet the minimum, you will be contacted and re-booked or refunded. If Paradise Pedals is unable to provide a tour for any reason, a full refund will be issued. Calling all craft beer lover’s! Pedal through Honolulu’s arts and warehouse district, Kaka’ako. Meet new friends from around the world as you pedal to three local brewpubs for Hawaii’s best brewed beer. Pay as you go on this 2.5 hour tour! Not all the seats require pedaling. There are 5 seats that do not require pedaling. The two seats over the rear wheels and the bench seat which seats 3 passengers. Paradise Pedals Hawaii offers tours rain or shine. If severe weather persists and it is unsafe to be on the road, we will issue a refund or grant a rain check. Changes and cancellations are allowed up to 72 hours prior to tour commencement without penalty. No-shows and changes or cancellations within 72 hours are subject to a full charge. Pedal your way through Kaka’ako, Honolulu’s arts and warehouse district, on this 2-hour adventure! We’ll depart from Kewalo Basin Harbor, located on the outskirts of Waikiki where the historic Fisherman’s Restaurant once called home. Grab your camera as your guide steers you and your new friends to see some of the popular POW! WOW! murals and SALT. POW! WOW! is an art festival expanding to cities and countries across the globe with the central event taking place in Honolulu, every February, when the new murals emerge. SALT is a dynamic city block designed for exploration and engagement within the Kaka’ako community where you will get to enjoy an acai bowl or smoothie at the local favorite, Lanikai Juice! Hop on Hawaii’s only 15 passenger bike with folks from around the world and pedal through Kaka’ako, Honolulu’s Arts district, stopping at some of the most popular murals! a great for families and photo ops! Enjoy an acai bowl or smoothie at the local favorite, Lanikai Juice! Pedal with folks from around the world through Honolulu’s trendy arts and warehouse district, stopping at the most popular POW! WOW! murals and local brewery for lunch and a pint! POW! – It’s the impact that art has on a person. WOW! – It’s reaction that art has on a viewer. Together they form POW WOW, which is a Native American term that describes a gathering that celebrates culture, music and art. Pedal through Honolulu’s arts district, stopping at some Pow! Wow! 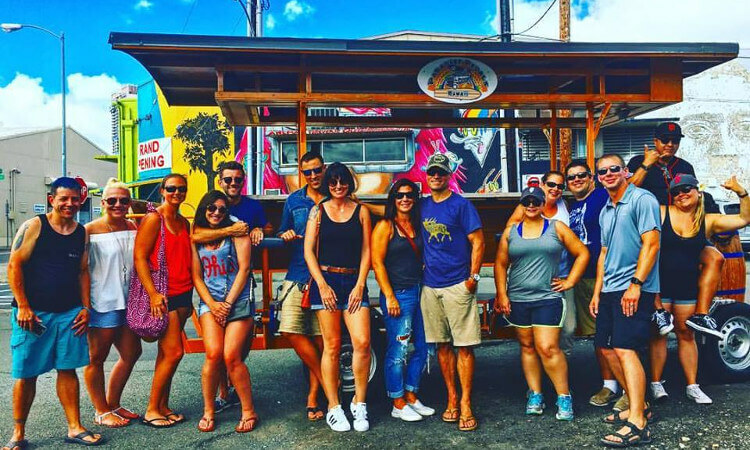 Murals and a Honolulu Brewpub for lunch and pint of craft beer that’s included on this 2-hour tour! Great for photo ops and meeting new friends. You must be at least 21 + years of age to ride on this tour.